​​From the beach to the Jungle, spend 8 adventurous days as a family exploring the best that Belize has to offer. From the unspoiled diving on the barrier reef of Belize, to ziplining through the rainforest, we dare your kids to say "I'm bored" on this action-packed adventure. Upon arrival into Belize City, pick up your rental car (intermediate SUV), for the drive down to Placencia on the beach (approximately 2-1/2 hours). Check into the Robert’s Grove Beach Resort for your 4-night stay with 2 dive days. Robert’s Grove is a beautifully appointed Hacienda-style beach resort nestled on 22 acres of the finest white sand beach in Belize. 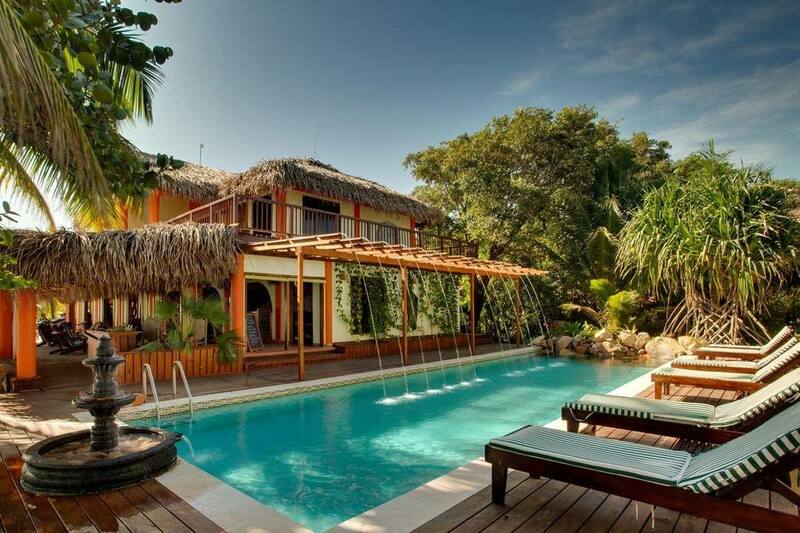 Its ideal location allows guests to be surrounded by Belize’s best attractions: the barrier reef, tropical rainforest and Mayan ruins. From Belize City, a flight here takes about 30 minutes and a road trip about 2 ½ hours. Classic Vista Family rooms have an extra room with bunk beds for the kids. All Vista rooms are air-conditioned and have ceiling fans, private terraces, safes, free WiFi, satellite televisions and small refrigerators. Diving! Dive into the wonders of the magnificent Barrier Reef of Belize. The resort’s fully certified PADI 5 Star Dive Center is ready to guide you through this remarkable underwater paradise with multitudes of Gorgonian fan corals, enormous sponges, hundreds of colorful fish, sheer coral-encrusted walls and the wondrous Pelagics. As the experienced PADI Divemaster will show you, Placencia is the springboard to some of the best Belize scuba diving. Here, the edge of the world's second largest Great Barrier Reef, comes south along the coast of Belize, and separates itself further and further from the mainland, resulting in a broad expanse of coral reef with channels that go down from 90 to 110 feet, but rising abruptly into shoals and cayes, providing many nearby SCUBA locations. At last official count, there are a minimum of 20 named Belize diving sites in the southern waters off Placencia, bursting with untouched coral and abundant fish life. Drive to Caves Branch Jungle Lodge, the perfect spot in the rainforest for excellent adventures (approximately 2 hours)! 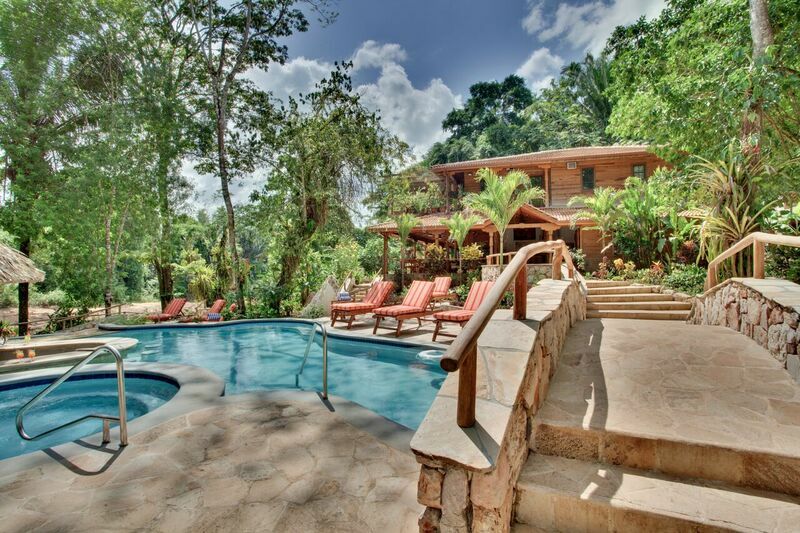 Caves Branch Jungle Lodge offers rustic but comfortable accommodations. The four jungle bungalows come with private bathrooms, queen-size beds with extra futon beds, and wrap-around verandas. The 58,000 acre Caves Branch Estate has a variety of exciting experiences to try. Float down a river going through caves, trek the jungle during the day and spot nocturnal life during night safaris, explore Mayan ruins and ceremonial caves – you can even take a day trip to Tikal – and get sporty with river kayaking, jungle mountain biking, rappelling and spelunking. Most Caves Branch activities can be modified to suit the whole family! After the fun day, relax in the pool and jacuzzi, have a great meal, and fall asleep with the jungle sounds and the river babbling surrounding you. Return the car to Belize City International Airport and catch your flights home. Your family will go bananas for Belize!